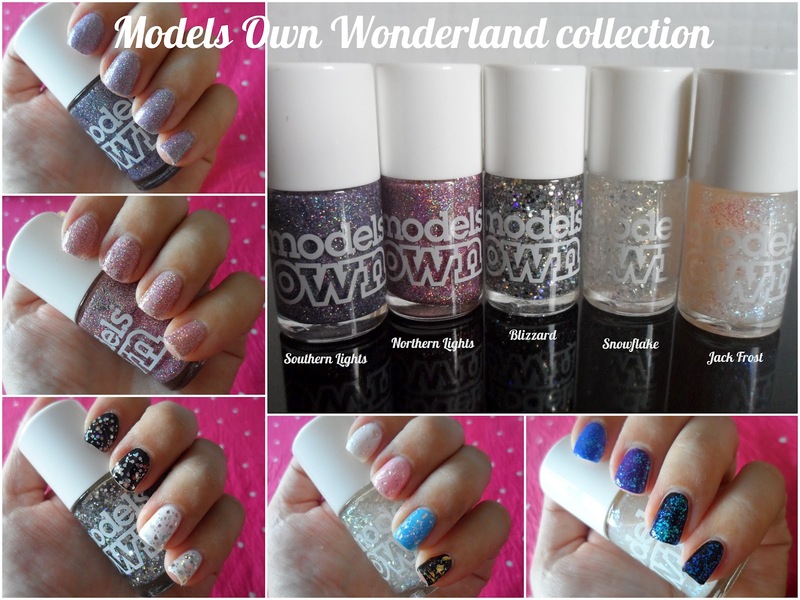 Models Own Wonderland collection swatches and giveaway!! 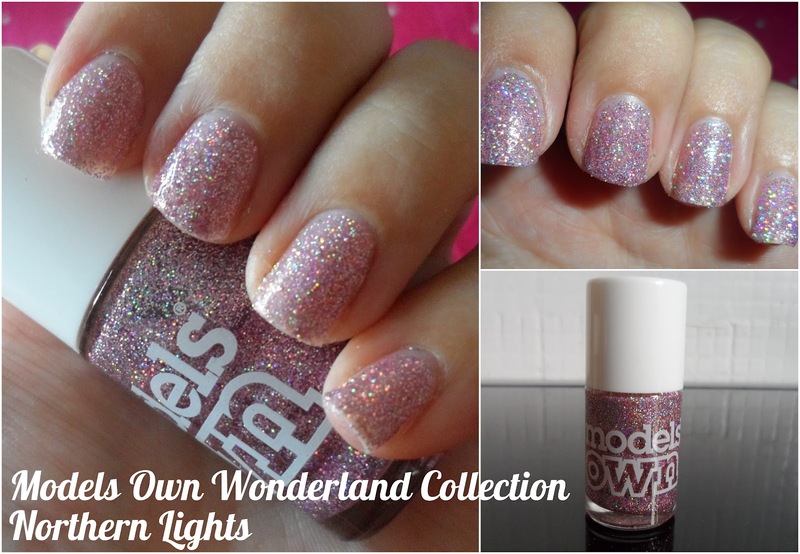 The Models Own mirror ball collection only came out a little over a month ago (see my swatches of that collection here) and yet we've been blessed with another oh-so sparkly set of polishes already. 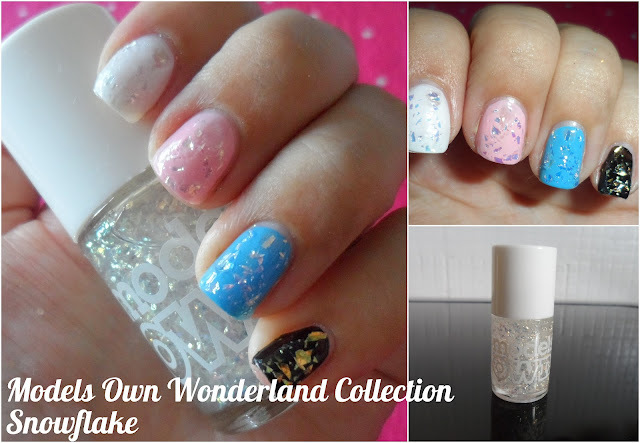 This is the Wonderland collection. I saw these on the Models Own facebook page and did a little swoon. They launched in Boots and the Westfield bottle shop today, so I ran down to Boots this morning and managed to snag the whole lot like a greedy so and so. 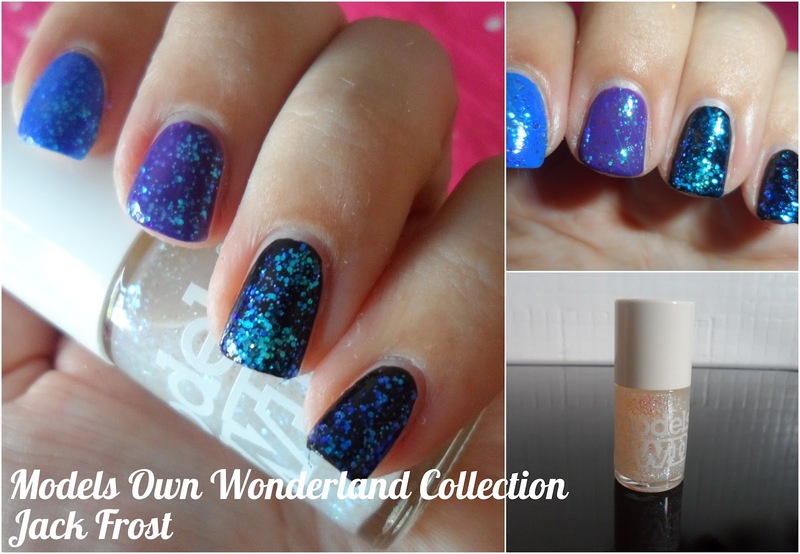 Originally I had only intended to buy the glitter top coat style polishes from this collection, which are blizzard, snowflake and jack frost as I figured I didn't need another lilac or pink glitter polish. But, you know how it goes, when I saw the polishes up close I couldn't resist. Plus Boots had these on 3 for 2, so that sort of made it okay to buy the lot. As soon as I got home I eagerly set about swatching, so here's the Wonderland collection in its full glory. The nails on the left of each set are in daylight and the ones on the top right are with flash. Ahhh so pretty. Which is your favourite? 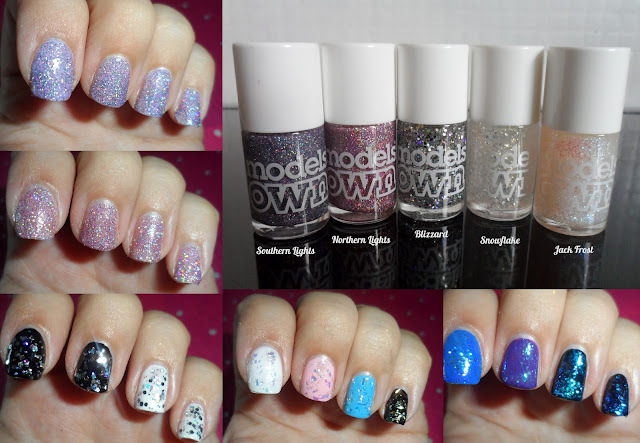 Northern and Southern Lights are not opaque polishes but they are quite full coverage for glitters. I think you could get them opaque in about three coats. My swatches of Northern and Southern Lights are two coats over an opaque-ish Seche base coat. I originally swatched Jack Frost over some lighter colours before realising it showed up better over the dark ones above. Below is an idea of how it looks over lighter polishes, but my camera found it hard to pick these up - it looks much more sparkly and pearlescent in real life. And finally another look at the whole collection together - these are all with flash. I'm pleased I got all of these - I hardly ever wear a simple block colour on my nails any more, I seem to always be sticking some sort of funky top coat on for good measure, so I'll be getting loads of use out of these. 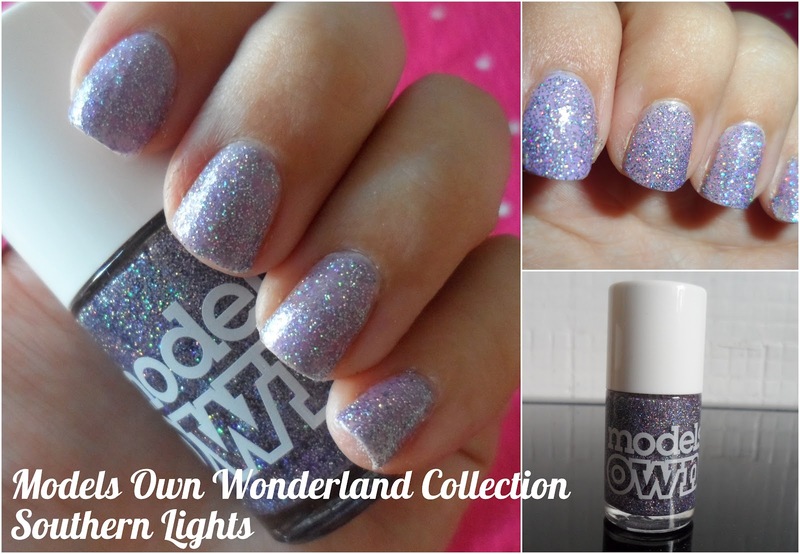 The wonderland collection is not going to be available from modelsownit.com until Friday 12 October, but you can win Snowflake polish right here right now as I picked up an extra for you on my 3 for 2. To share this post just click here to go to my facebook page. Under the photo of the Wonderland polishes click share and make sure it's set to 'public' (top right corner of the share window) or else I won't be able to see it! This giveaway will be open until 11.59pm on Sunday 14 October - Good luck! Ts&Cs - one entry per person. To enter you must be a follower of www.flutterandsparkle.com through Google Friend Connect, Hello Cotton or Facebook. 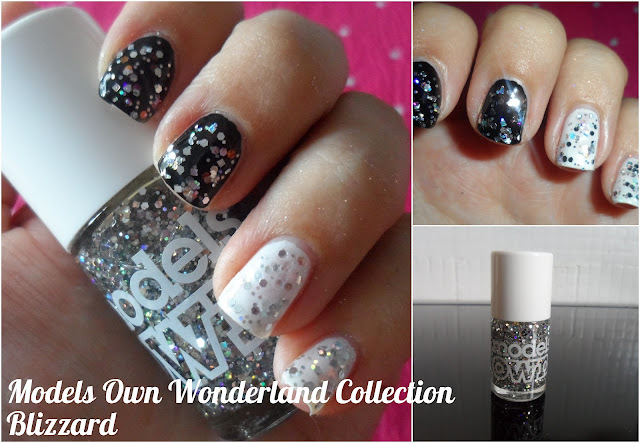 To enter you need to 'share' the Models Own Wonderland post found at http://www.facebook.com/flutterandsparkle Entries made via the blogger comments form are not accepted. The giveaway will close at 11.59pm on 14 October. The winner will be picked at random using a random number generator. Prize is one brand new and sealed bottle of Models Own snowflake polish - no alternatives available. Prize will be posted within UK and ROI only due to postal restriction on sending nail polish via air mail. They're too pretty to be half price I guess! They are on 3 for 2 at Boots though! Oh no! Maybe add them to your Christmas list instead - it's never to early for that! Ooooh yes! Swatches! Thank you for this hun :) Its funny, Northern & Southern lights are the 2 that I thought I would bypass but looking at them on the nails they are the 2 I want the most now! Also how GORG is Jack Frost?! WANT! Me too! I would have chosen Northern or Southern lights for the giveaway but I bought the last ones on the shelf! I think I'm in love with Jack Frost...it's stunning! These are gorgeous! It's hard to choose a fave! They are so beautiful i have looked already to two boots stores and failed miserably for these polishes i am so excited for friday to come. 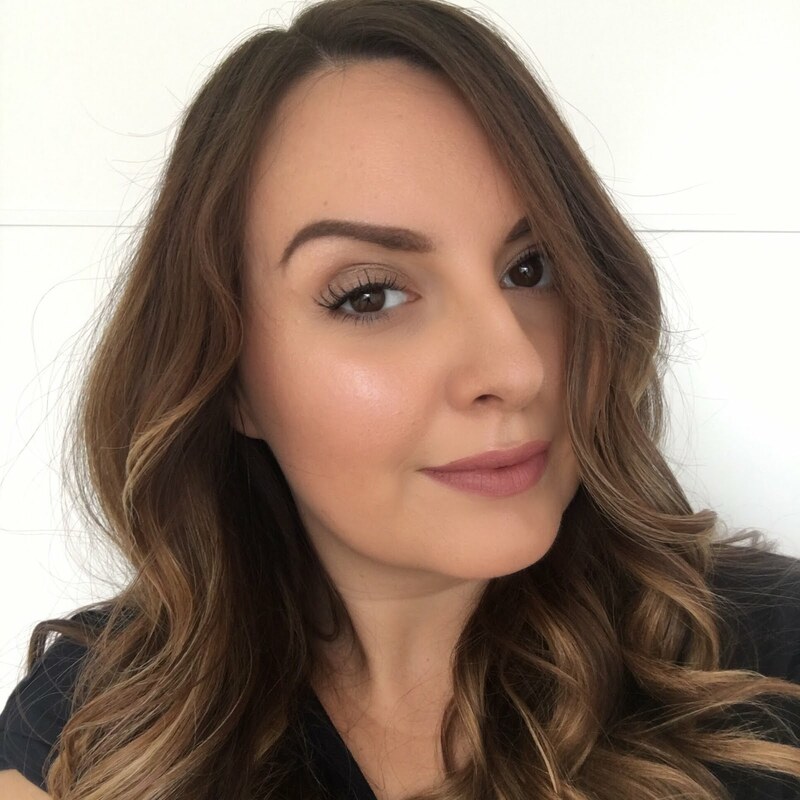 GFC and FB follower: Ingrid Miranda. Such a good competition! The polishes are gorge. I love the Nothern and Southern Lights the best, such pretty colours. Ooohhh I hope I win this! Following via GFC as Whitters (may show up as Apple? My GFC always switches between those names :(..no idea). I think I follow you on instagram too! Your face looks familiar! Also, I shared this on FB! I love these polishes - i picked up Snow Flake on Friday and love the effect it gives.